GPS system marketing in the form of videos are being used by businesses to effectively market their solutions and softwares in this world of ever growing technology. A GPS system always comes handy for accurate location tracking and are extremely versatile and can be found in almost any industry sector. With the need and use of GPS systems growing exponentially, companies providing these softwares are turning to video marketing to gain a competitive edge in the GPS market,by educating their potential consumers about their products and services. GPS system is a tracking system that allows users to track the position of a moving object. It is a radio navigation system that determines the exact location in all weather conditions, anywhere in the world. Tom Tom is a leading provider of navigation and GPS solutions. Smarter than ever, the TomTom GO GPS navigation system integrates seamlessly with your phone. It can read out your text messages and enable full use of your phone’s personal assistant. Built-in Wi-Fi makes it extremely simple to update any of your world maps- no computer needed. The GPS solution video represents the best features of the Tom Tom GPS system. With Hertz NeverLost GPS Solution, you can plan your whole trip online including all your destinations before you leave. And when it’s time to return your rental car, all Hertz drop off locations are pre-loaded. Unlike using a smartphone, NeverLost GPS is secured to the dash, won’t drain your phone battery, doesn’t rely on spotty cellular service and won’t subject you to potential high data charges. The GPS solution video shows how NeverLost is navigation you can count on. Trinetra GPS school bus management system gives insights to track school bus location with speed, exception monitoring and many more useful features. The school bus tracking software helps all educational Institutions to handle GPS fleet Management in a better manner and facilitates better decision making in all scenarios. The GPS solution video shows how Trinetra offers comprehensive solutions for your business challenges in Vehicle Tracking and Fleet Management. Flywheel includes a fare meter, GPS, payment processor and the ability to pick up new fares from Flywheel’s ride-hailing app for passengers. Taxi drivers only need an Android smartphone equipped with a card reader attachment to do everything they need. On the taxi company side, dispatchers can access Flywheel’s TaxiOS through a web browser. The GPS system video shows how Flywheel is modernizing taxi technology with their services. Vismo is a GPS tracking application designed to locate individuals travelling the world using their smartphone, tablet or personal GPS Trackers. Vismo uses GPS and other technologies to provide the best GPS tracking updates even indoors. Geo-fence and panic button alerts allow your security team to track, protect and respond to employees as they travel to high-risk areas, as demonstrated in the animated GPS solution video. AssetTrackr provides real time Online GPS vehicle tracking solutions. They provide very compact device which can be fitted in commercial vehicles, bikes & trucks. Their solution is trusted by Companies like – BigBasket, DTDC, GMR, Emami and thousands for medium to small businesses. 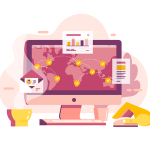 The animated GPS solution video shows how AssetTrackr provides a wide range of logistics and transport automation solutions catering to Manufacturers, Cargo, Logistics, FMCG, Retail and last mile delivery companies. myGeoTracking is an inbuilt GPS based Fleet Tracking and Management Solution which lets you track, locate, monitor and manage your trucks and drivers without expensive GPS or telematic devices. Fleet Management made really easy with myGeoTracking’s fleet management solutions. Their fleet tracking products come with a wide range of inbuilt features like Mileage estimator, map visualization, reports and analytics, hours of service (HOS) etc. which makes it one of the best fleet tracking tool. The GPS solution video lists out the advantages of using myGeoTracking fleet management software to effectively track your fleet. The hereO GPS watch is the world’s smallest real-time cellular-connected GPS tracking system. Designed, developed and geared to kids age 3 and up, parents can now enjoy true peace of mind with regard to their children’s safety. 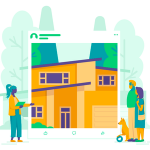 With real-time pin-point tracking, breadcrumb trail logging and smart location alerts, the GPS system video displays how parents can track their children’s whereabouts directly from the hereO Family smartphone companion app. Rewire Security offers clever, cost effective GPS tracker systems for vehicles, fleets, cars, motorcycles, boats. Rewire Security is a supplier of all sorts of Security systems including but not limited to, vehicle CCTV, vehicle cameras, body-worn cameras, covert cameras, portable magnetic GPS trackers and drone trackers. Their products use GSM cellular phone network for communication & GPS of satellites for location. The GPS System video illustrates how Rewire Security’s GPS system enables itself to operate effectively anywhere in the world where there is a mobile phone signal. With OutreachGPS, tracking is faster and more efficient. You can save big with your insurance provider by having the ability to remotely shut down your vehicle in case of theft. With OutreachGPS’s remote door unlock feature, you no longer have to worry about locking your keys in the car. Keep track of your vehicle in real-time with OutReachGPS’s “LIVE TRACK” optional program as demonstrated in the GPS system video. Whistle is a GPS-tracking platform where needs are met at the last minute. Whistle is evolving the way the world moves. 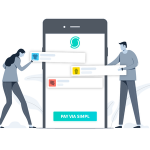 By seamlessly connecting people with one another, they build relationships through their app. Whistle provides capabilities to search, consume services provided and communicate with individuals for common interest as shown in the GPS solution video. Where’s My Staff is a smartphone application developed by Tragging Company for helping managers track their employees during working hours. Their system is suitable for both indoor and outdoor attendance management. Based on NFC and GPS technology, “Where’s My Staff” can track employees, both internal and External staff. It is an attendance & tracking app that can replace the traditional attendance machines. The GPS system video shows how you can use this attendance app as GPS locator, so you can locate and track your employees, colleagues who work outside the company. Coolasia Fleet Manager is a web-based system that is user-friendly and Dynamic. Their systems helps enterprises, business owners and fleet managers optimize business operations and manage their local workforce effectively through GPS location technology. The GPS system video demonstrates how Coolasia systems ensure businesses maximize the efficiency of their mobile assets through industry-leading tracking and scheduling applications, allowing both mobile and office-based staff to streamline operations, maximize productivity and minimize fuel and staffing costs. Visirun is a GPS tracking system that shows you in real time where your vehicles are and what they are doing. It detects the operator’s driving style and fuel usage and economy. IT helps you to respect the driving and rest hours laws. Visirun allows you to protect your customer’s goods and to optimize the communication and missions management. The GPS system video shows how Visirun coordinates and communicates directly with drivers and technicians. Fleetfinder is a GPS Tracking solution, fleet management & business management system. It provides a complete range of reliable, robust & high quality hardware utilising GPS, GSM, SMS & Iridium Technology. The web based tracking solution requires no 3rd party monitoring & offers a wide range of detailed but user friendly reports. With worldwide mapping applications, the GPS Solution video shows how fleetfinder is the best choice for your GPS Tracking application, anywhere in the world. VAST GPS System has the best Web and Application features as we always update and improve ourselves based on the feedback we receive from our clients. It is available almost in all major cities in your city through distributors, resellers and agents. With VAST, the vehicle can be in the settings to send an alarm when entering / exiting the region or when it exceeds a certain speed. The GPS system video marketing shows the features and benefits of VAST GPS System. Cargo Defenders Ltd is involved in the Logistics security sector. Cargo Defenders other systems include Trailer Security/Alarm Systems, Van Security/Alarm Systems and cost effective GPS Vehicle Tracking. Keep control of your fleet with Cargo Defenders GPS fleet tracking system which provides in-depth information on the location and operation of your fleet. The GPS system video shows how Cargo Defenders provide GPS vehicle tracking through our MultiTrack fleet management platform. Smarterping from Sathya Technosoft- one of the leading vehicle tracking systems that allows you to view the location of your fleet vehicles in real-time, 24 hours a day from anywhere. It offers real time tracking systems for fleet management and security applications of the vehicle and driver, containers monitoring, merchandise tracking and management, and a personal locator for the protection of individuals. Using Smarterping, you can track the location of your vehicles immediately using your smartphone or computer as shown in the GPS system video. Sam GPS Security is India’s popular GPS tracking and vehicle anti theft solution for almost all types of automobiles such as bike, car, truck, bus, e-rickshaw etc. Smart Automobile Management (SAM) integrates hardware and software, to extend your visibility while you are away from vehicle. One can track their vehicles from anywhere with the help of Sam GPS tracking mobile app. It is suitable for both family and business needs. The GPS solution video shows the features of Sam GPS Security. Shenzhen Diwei Machinery Co Ltd. makes it easy for you to pinpoint the location of every single vehicle in your fleet. With their technologically advanced GPS vehicle monitoring and tracking systems, you get the ability to track your vehicle in real time. With their wide range of services like 3G GPS Tracking System, GPS Tracker OEM/ODM, GPS Tracking Solutions, You are sure to get the perfect solution for your vehicle and car tracking and fleet management requirements. Watch the GPS solution video marketing to see how you can locate your vehicle anywhere, anytime with Shenzhen Diwei Machinery’s GPS Tracking Solutions! With the above GPS system and solutions video examples, it’s evident that companies are fast integrating videos in their marketing campaigns and various other touchpoints. If you are planning to develop these videos, a good start is to develop a brief of what can be the tone and style for your videos. We advise you to be different and unique while you create your messaging through the videos.